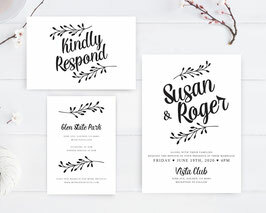 Your big day is upcoming, invite your guests to your classic ceremony with our Formal Wedding Invitation Sets. Elegantly designed, our formal invite set will give your guests the details of your upcoming wedding. This black and white invitation sets exactly what you need, including invites, RSVP postcard and extra Info cards printed on premium paper.